I started you out easy this month with the linen closet and the hall closet. So now we’ve worked our way up to the big one...master closet organization week! 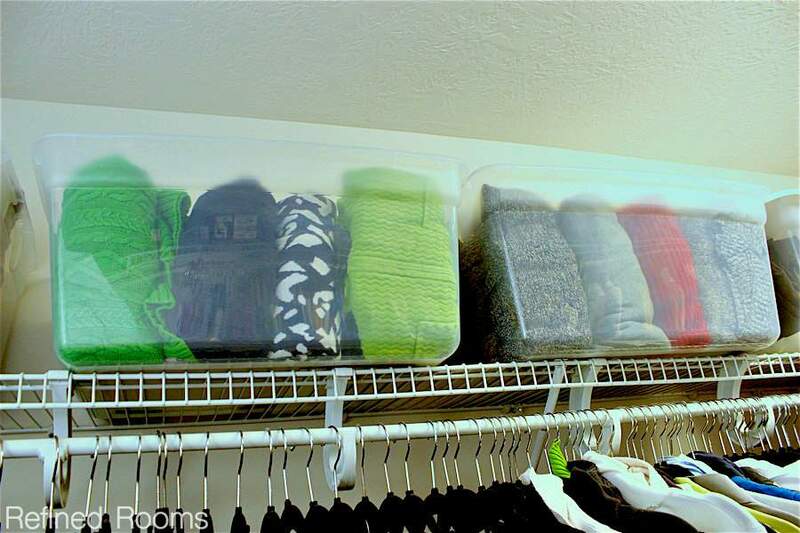 This really is one of the key spaces to organize in your home. 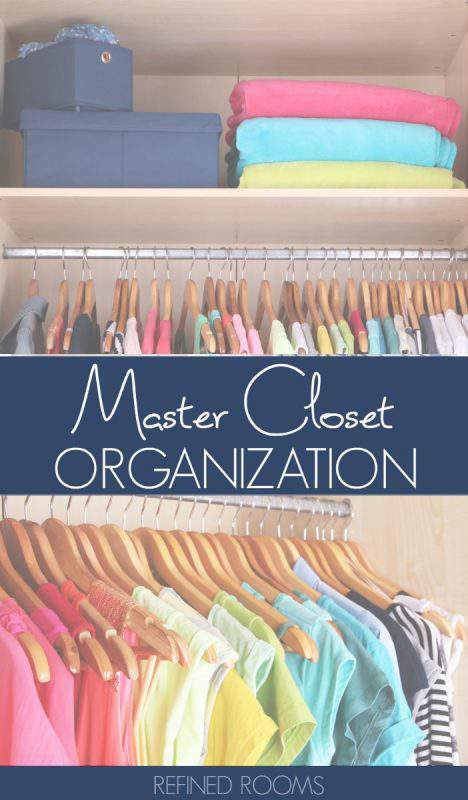 Having an organized master closet helps you to start your day off right, since you can put an outfit together much more quickly when every clothing item and accessory can be easily located. Begin by setting some specific goals for your project. Do you want to focus on ridding the closet of clothing that no longer fits? Maybe your goal is to make it easier to put clothing away on laundry day and at the end of the day. If you made the closet more visually appealing, would that motivate you to maintain it better? Once you’ve gotten clarity on your organizing goals, prepare for your closet organizing session by getting your declutter kit. Set up the following sorting bins: Relocate, Donate, Sell, & Repair. Have a trash bag handy as well. Plan to use your bed as the main sorting area. If your closet is busting at the seams, I would highly recommend that you make a plan to keep only the “in season” wardrobe in your master closet. Find an alternative place to store out-of-season clothes and maternity clothing, such as under the bed, or in the basement. Pull everything out of the space onto the bed. Give that closet a thorough cleaning by wiping off shelves, dusting the baseboards, and vacuuming the floor. 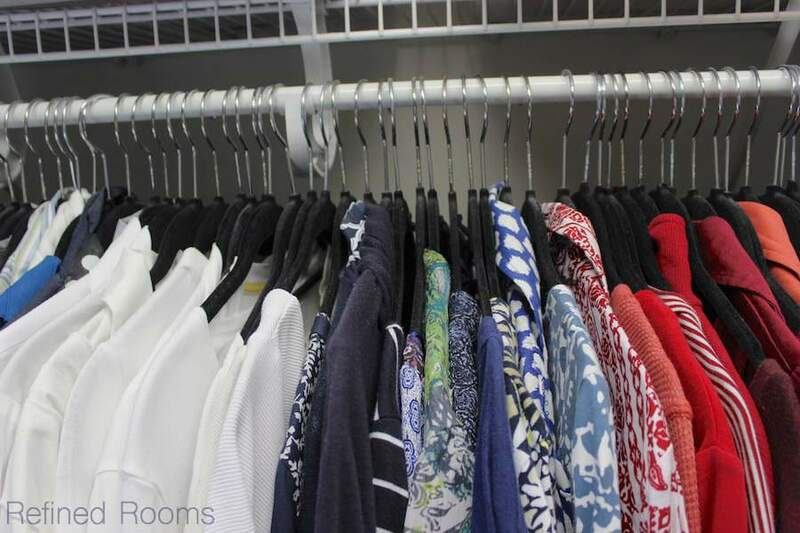 If you have a large walk-in closet, you will probably need to repeat this process in stages (emptying out, cleaning and sorting one side at a time, or one section of the closet at a time). Otherwise, you’ll get overwhelmed by the sheer volume of items you’re sorting through. As you go through each item in the closet, don’t forget to toss those items that obviously don’t belong in the closet into your Relocate bin. When working with clients in the past, we’ve uncovered tennis rackets, books, toys, and a container of aluminum foil during our closet excavation process! Of course, anything that you plan to keep that requires a repair should go in the Repair box. Once your items are sorted into categories, it allows you to easily see that you have 20 navy blue skirts. The obvious question becomes, “do I need 20 navy blue skirts?” . I would venture to guess that you only wear about 3 of those 20 skirts, since they fit you well and make you feel like a million bucks when you wear them. This week, I urge you to let go of the other 17 navy blue skirts that are out of style, stained, torn, or no longer fitting you well. As you decide to let go of items, you’ll need to make a decision whether those items go in the Donate bin or the Sell bin. 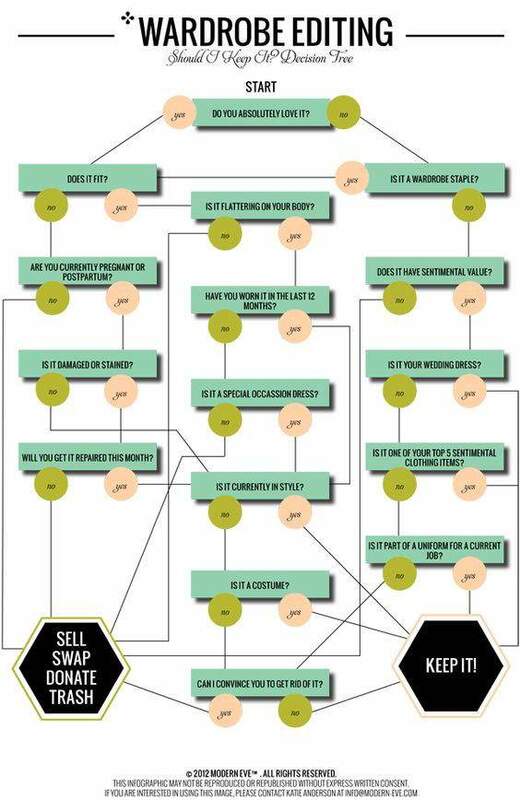 Read this post for more information about the donate vs. sell decision. Get those donation and sale items out of your house asap once you’ve completed the master closet decluttering process. Now’s the time to make an appointment to repair those items in the Repair bin as well. Phew! I bet it feels like you lost 1,000 pounds! Now’s the time to take a step back and scrutinize the organizing “bones” of your closet space. If you’ve only got the builder-grade single bar running the expanse of the closet, there are definitely some basic modifications you can make to maximize storage space. It can run the gamut from installing a custom storage solution (I highly recommend the Container Store’s Elfa system…you can read why I love Elfa here), to simply adding a double hang closet rod. Following basic organizational principles, decide where each category of items will live in your closet and what organizing products you’ll use to contain and organize those items. As you make your decisions, be sure to be on the hunt for unused vertical space on the walls and on the back of your doors that you take advantage of. Today, we’re going to get up close and personal. I’m inviting you into my own master closet in order to to illustrate some of these concepts. We’re lucky enough to have a fairly large walk-in closet that my husband and I share (with “his” and “hers” sides). We’ve got future plans to pimp this closet out with a gorgeous custom Elfa storage system, like we installed in our daughter’s closet and our guest room closet. Although it’s not quite Pinterest-worthy yet, we do a pretty good job of maxing out every square inch of storage space with the builder-grade “skeleton”. The wing wall (area immediately adjacent to the door) is on my husband’s side of the closet. We use the lower area for his shoe storage. There are endless ways to organize and store shoes in the closet, but I really love the way these stackable shoe organizers work in our space. I have twice as many shoes as my husband. 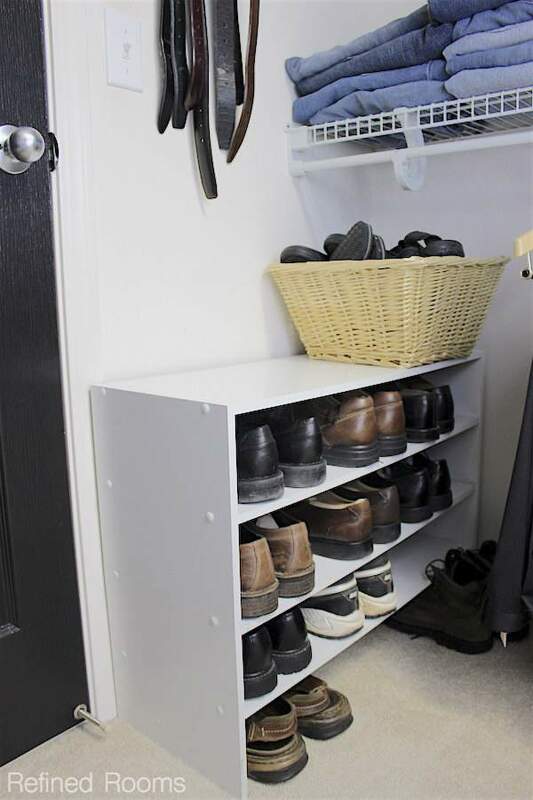 My collection of shoes is divided between current season shoes that I keep on this stackable shoe organizer, and off-season shoes that are stored under my bed in an under-the-bed shoe organizer. 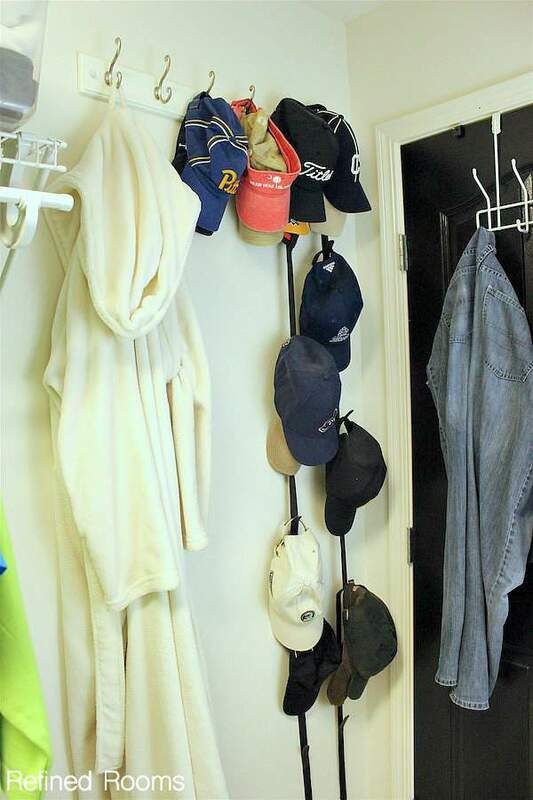 We took advantage of the unused expanse of wall behind the closet door and created a storage area for robes and baseball hats. We installed a hook rail and hung two cap racks from the hooks to expand the hat storage area down the wall. Do you see that over-the-door hook rail to the right? That’s where my Hubby stores his “I’ve worn this, but it’s not quite dirty enough to go to the hamper, and I can probably get one more wear out of it” items. On the back end of the closet, I hijacked my husband’s side of the closet and use it for accessory storage. 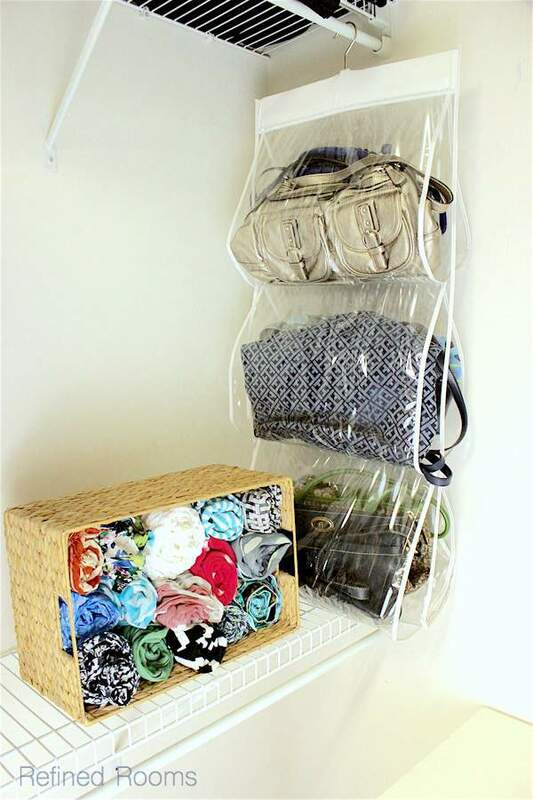 This hanging purse organizer does a great job of storing purses and keeping them dust free. 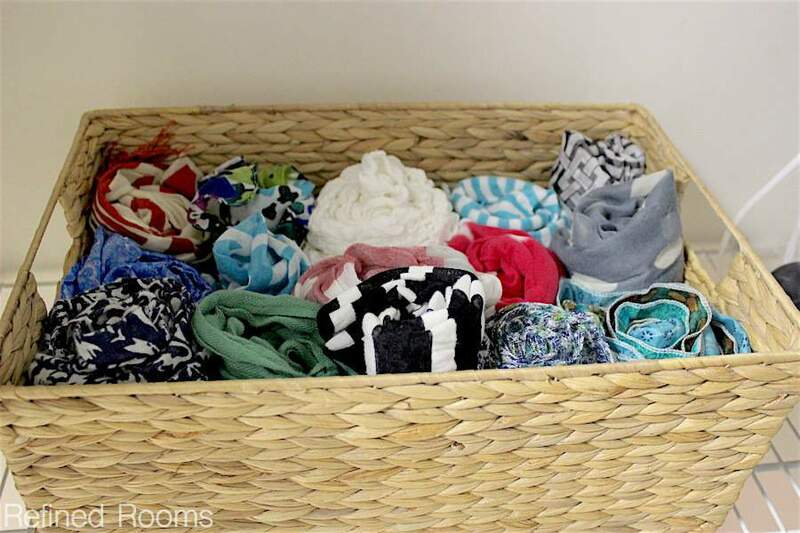 I use one of my fave organizing products, the Container Store’s water hyacinth baskets, to store my in-season scarves (the out-season-scarves get stored away in the adjacent dresser that lives in our closet). 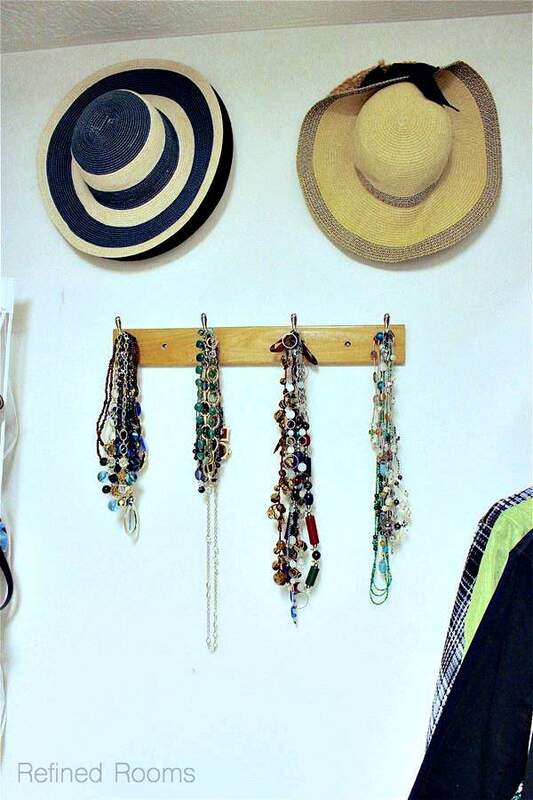 I installed hooks for hat storage and another wall-mounted hook rail to store my necklaces. My other jewelry lives in my bedroom, but I love this “tangle-free” method of necklace storage. We each divide our closet into work/dressy and casual clothing zones. My husband claimed the side of the closet with double-hang storage capacity. 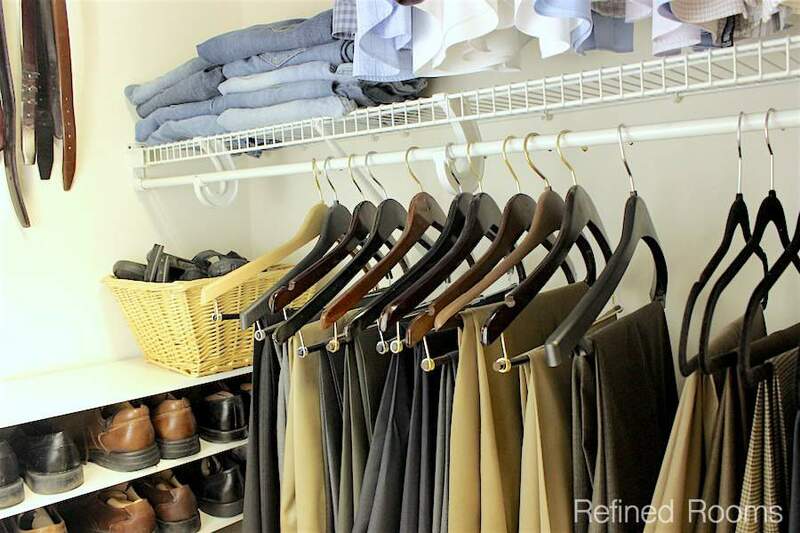 His work clothing zone is near the front of the closet, with button-down shirts on top and dress pants on bottom. He prefers wooden hangers to keep his pants as crease-free as possible. I occupy the long-hang side of the closet. Unlike him, I’m a huge fan of non-slip slimline hangers. Whatever your hanger preference, I strongly recommend investing in a matching set of hangers. Not only does it make the closet much more visually appealing, it reduces the chance of hangers getting twisted up and caught on one another. Another pro for slimline hangers – they come in a variety of colors so you can really have fun introducing a pop of color into your space if visual appeal is one of your goals! Depending on your level of obsessiveness, you may want to go the extra mile and group your clothing by color. It may be overkill to some, but personally I find that it really helps me to locate what I’m looking for more quickly. If you were wondering how I use the space under my hanging clothes, here’s your answer. 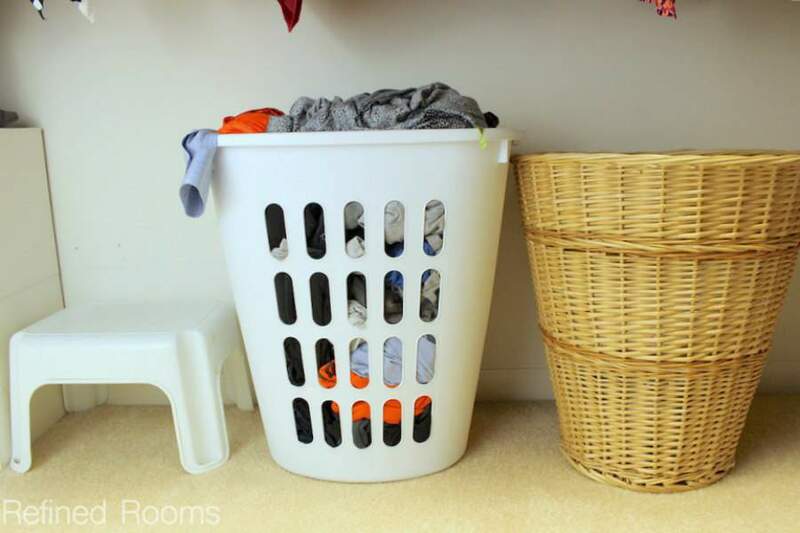 Our laundry hampers live there, as well as the footstool I need to use to access my husband’s clothing shelf on his side. 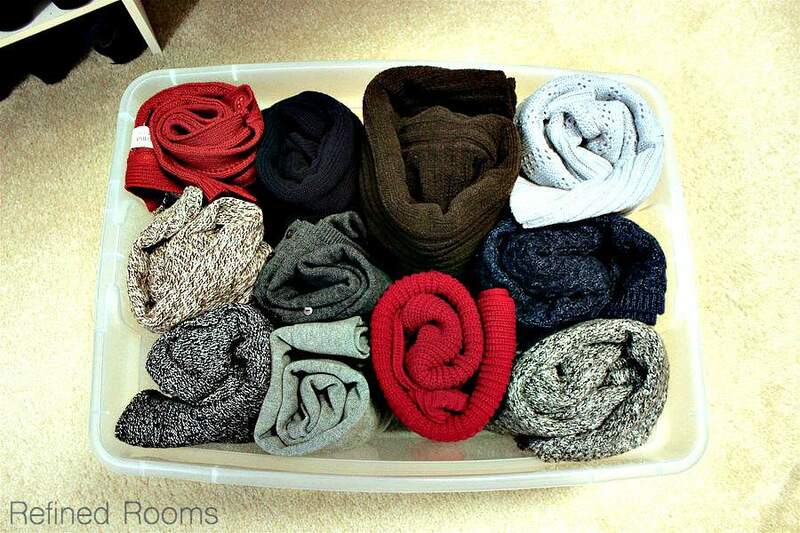 Each bin contains a particular category of clothing (fall/winter sweaters, spring/summer sweaters, sweatpants, etc.). Whenever possible, I roll my garments in KonMari-esque style so that I don’t have to sift through stacks of items to grab the item I want. It’s unorthodox, but it works for me! I follow the organizing principle that the most used items should be placed in the most accessible locations. So each spring and fall, I swap out the position of the various storage bins based on what I’ll be using most often during the upcoming season. 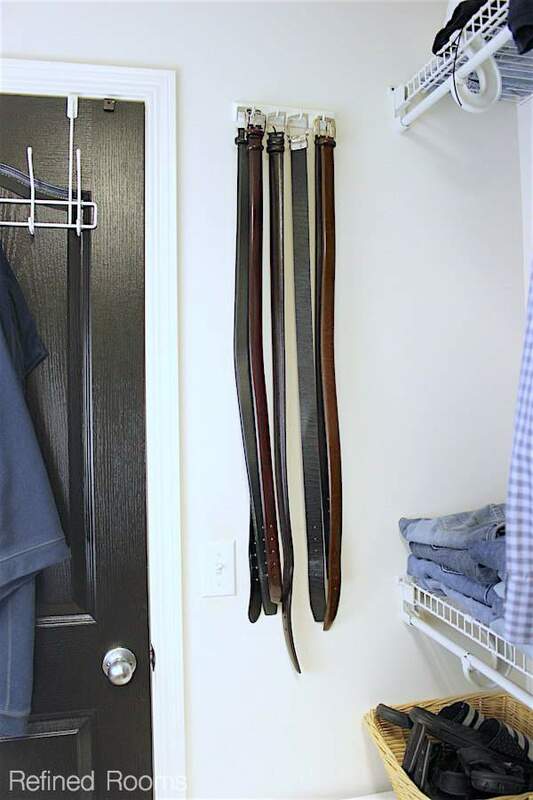 Like other closets in your home, I recommend a twice-a-year maintenance session for the master closet. For me, the most logical time for these closet maintenance sessions is in the spring and fall, since it coincides with the change of seasons when you’re swapping the location of your in-season/out-of-season wardrobe. After you’ve completed this week’s assignment, share a photo of your gorgeous master closet on Instagram (use the hashtag #OrganizeandRefineChallenge and don’t forget to tag me) and/or share it in the Refined Rooms Facebook community. Happy Organizing! Totally what I need to do! Thanks for the tips and motivation! Spring is the perfect time Dee! Thanks for stopping by!